July 18th – 21st, 2019! 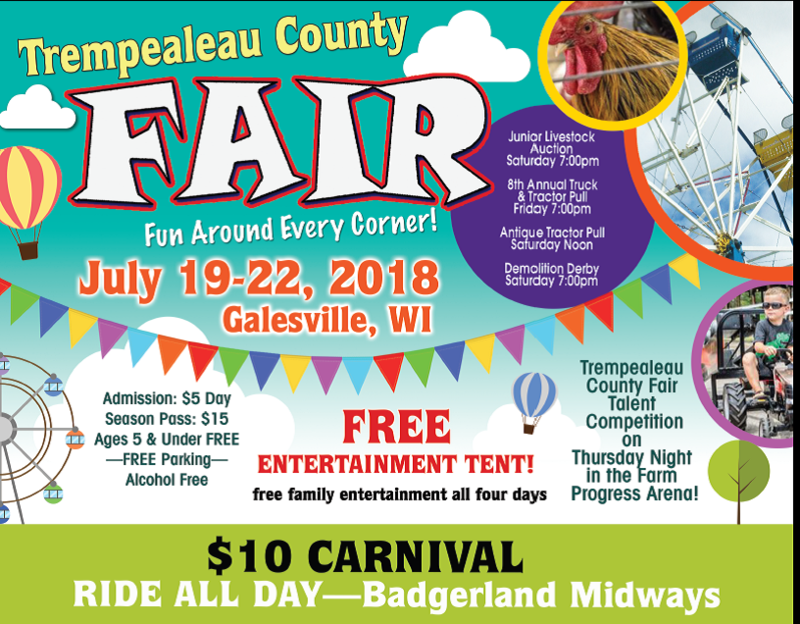 It is the 160th annual Trempealeau County Fair this year! It takes place from July 19th through 22nd, 2018 in Galesville, WI! Note: Please dis-regard the dates for the fair in the first screenshot. They represent the 2017 fair. 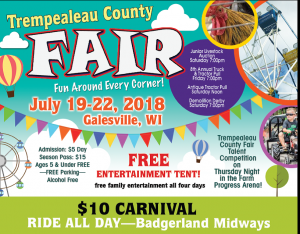 There is a website full of all of the Trempealeau County Fair information. This information includes the fair schedule, fair book, fair store, sponsors, and information about the larger events (i.e. demo derby, tractor pull, etc.). Very handy for answering any questions that you may have! Check out the 2018 Trempealeau County Fair champion and high marks results in the following categories: herdsmanship, dairy, poultry, sheep, swine, beef, horse, dogs, llama, cats, rabbits, exhibits going to the state fair, veterinary science, plant & soil science, field crops, vegetables, model garden, flowers & plants, arrangements, plant crafts, natural sciences, exploring & cloverbuds, cultural arts (including drawing, painting, ceramics, etc. ), photography, woodworking, electricity, mechanical science, foods & nutrition, clothing, knitting & crocheting, family living, history & heritage, and demonstrations.